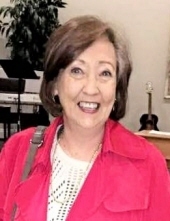 Carla Ann Darter, age 71, of Normangee, Texas, passed away Sunday, November 18, 2018 in Bryan, Texas. A celebration of her life is planned for 1 P.M., Wednesday, November 21, 2018 at Madisonville Funeral Home in Madisonville, Texas. Interment will be in the Willowhole Cemetery in North Zulch, Texas. The family will receive friends from 6 P.M. to 8 P.M., Tuesday, November 20th at the funeral home. Carla Ann (Beall) Darter was born October 30, 1947 in Henderson, Texas to Hiram Jasper & Elizabeth (Watkins) Beall. She was raised in Henderson and attended Tyler Junior College. Carla married Eddie Darter August 25, 1968. They lived in Tyler from 1968 to 1994 where Carla worked as a dental assistant. A move to Normangee, Texas came in 1994, and Carla became a member of the Union Baptist Church. Carla enjoyed quilting. She was a member of the Stitching Hens Quilting Group. Additionally, Carla liked decorating cakes and cooking. Most of all, Carla will forever be remembered as someone who lived and enjoyed life to it’s fullest. Carla was preceded in death by both of her parents. She is survived by husband, Eddie Darter of Normangee; daughter, Kristi Darter of Normangee and grandchild, Harlee Hutchinson. To send flowers or a remembrance gift to the family of Carla Ann (Beall) Darter, please visit our Tribute Store. "Email Address" would like to share the life celebration of Carla Ann (Beall) Darter. Click on the "link" to go to share a favorite memory or leave a condolence message for the family.